The Future of DNS Management. The DNS Management of the Future. Streamlining network management (bringing together on-premise DNS, DHCP, and IPAM with multi-vendor cloud DNS and IPAM, compatibly) is more important than ever. Cloud-based systems and the rapid expansion of digitally connected IoT are driving infrastructure growth. It’s especially important for companies to have full visibility, authority and control across public, private, and hybrid networks. The foundational technologies of DNS operations have stayed largely the same. DNS management, however, has changed and adapted - and keeps changing and adapting-- to meet the new challenges of business services and growth. As enterprise IT moves to the cloud, it creates the necessity to have effective DNS and IPAM in the cloud as well. Importantly, it’s also necessary to have cohesive communication and oversight between both on and offsite environments to maintain uptime, smooth network functionality and prevent vulnerabilities. But making the switch to hybrid and migrating to the cloud can have its challenges, especially for those who already made significant investments in on-prem hardware and software, have numerous established DNS zones or who have large networks that they would need to bulk migrate. Further, navigating legal compliances across multiple geographic zones and ensuring data security at every connection point adds to the hurdles that companies face in maintaining, scaling, and updating their networks. Men & Mice knows a thing or two about these changing infrastructure needs and has been focused on creating solutions that simplify complex environments for nearly 30 years. Our software not only helps companies effectively manage existing DNS and IPAM needs, but adapts to meet future needs as networks scale. Our overlay network management solution, the Men & Mice Suite, provides customers with unprecedented stability, performance and scalability. Flexibility and scalability require a multi-platform solution where the same automation can drive DNS deployment no matter if it’s with AWS, Azure, NS1, Dyn, Akamai or something else. It also needs to effectively managing complex networks by eliminating visibility gaps between traditionally different deployments in public cloud and on-premise private configurations. 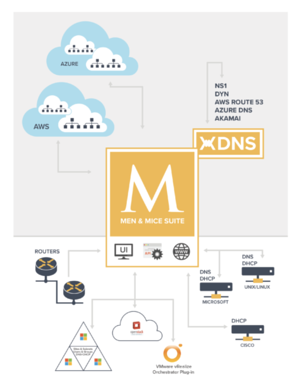 Our xDNS Redundancy streamlines DNS management across multiple service provider platforms, helping to mitigate DDoS attacks and other forms of DNS failure by providing centralized management of critical DNS services. Men & Mice Suite offers consolidated views in a unified console, secure monitoring and integrated management of all network spaces across platforms and on-premises, in the cloud, or in hybrid or multi-cloud environments. Additionally, authorized administrators are allowed to make changes directly through the Men & Mice Suite, with its robust access control, ensuring they can only change entries that belong to them. Men & Mice has been at the forefront of network management for almost as long as there were networks to manage. We’ve been creating DNS, DHCP, and IPAM solutions for decades for on-premise networks and have evolved our software solutions to cater to the growing needs of network administrators tasked with managing cloud-based DNS and IPAM. 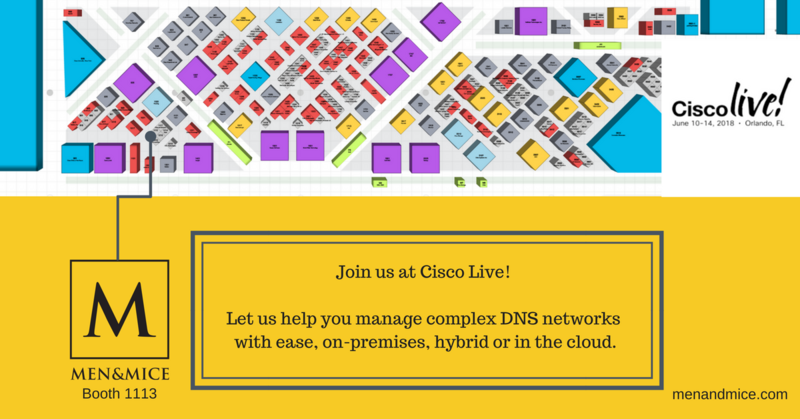 See you at Cisco Live! We love the theme of this year’s Cisco Live: IT that informs, connects, predicts and enables.It embodies the principles of the Men & Mice Suite. We'll be in Orlando, Florida from 10-14 June, to showcase the next generation of DNS and IPAM solutions for those overseeing the staggering number of IPs that comprise today’s DNS infrastructures. Visit us at booth 1113 to learn more.